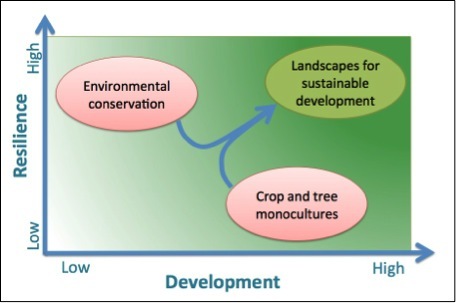 Making sustainable land use and biodiversity conservation a priority, both in forests and agroforestry landscapes. HYDERABAD, India (12 October, 2012)_A leading research program has agreed to join forces with the United Nations Convention on Biological Diversity as part of a broader goal to cut the rate of deforestation in half by the end of the decade and to promote sustainable management of farms and forests. “If a single tree is in your field, this is where birds will come and live. Trees in landscapes are central to sustaining terrestrial biodiversity so achieving the targets set out by the UN’s Convention of Biological Diversity would not be possible unless a multi-functional landscape management approach considering forests and trees is adopted,” said Robert Nasi, director of the CGIAR Research Program on Forests, Trees and Agroforestry who co-signed the memorandum of understanding (MoU) with the CBD Secretariat at Tree Diversity Day, held on the sidelines of this week’s 11th Conference of the Parties (COP11) in Hyderabad, India. At the same event, the CBD Secretariat signed another MoU with the World Agroforestry Centre, signalling a renewed commitment to the sustainable use of land resources and indigenous biodiversity, as well as ‘climate smart’ agriculture. The decision made perfect sense, Nasi said, noting that nature is holistic. Trees provide everything from food and fuel to genetic resources used to make life-saving medicines. They restore minerals to depleted soil, oxygenate the air we breathe and helm maintain the world’s fresh water supplies. “Virtually all visual representations of biodiversity have trees in them. Through this MoU, we are signing up to sustainable land use and biodiversity conservation, both in forests and agroforestry landscapes,” said Ravi Prabhu, ICRAF Deputy Director-General, Research. Finding ways to protect unique ecosystems in coastal and marine areas was also listed as a priority. Two years ago, at a conference hosted by the CBD in Nagoya, Japan, governments agreed on the so-called Aichi Biodiversity targets, which set out targets for protecting the world’s biodiversity. So far, 197 countries have signed on. Neil Pratt, the senior environmental affairs officer of the CBD Secretariat, said the help of the CGIAR — – an international consortium of agricultural research institutes — was crucial to achieving at least five of Aichi’s 20 targets. Pratt said Wednesday’s agreement was similar to one signed earlier with the International Tropical Timber Organization on sustainable use of tropical timber. Left to Right: Braulio Ferreira de Souza Dias, CBD Executive Secretary; Robert Nasi, CIFOR; Ravi Prabhu, ICRAF and Pablo Eyzaguirre, Bioversity, sign an MoU as partners in the CGIAR Research Program on Forests, Trees and Agroforestry and the SCBD (2012-2016). Kara Brown. Nasi agreed, and said the MOU to jointly study the diversity of tree species, will help CGIAR as well. “The CGIAR is trying to become more outcome orientated,” he said. 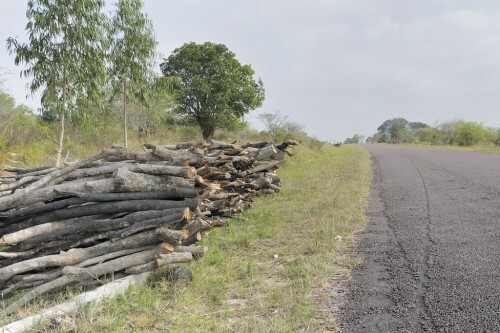 The Center for International Forestry Research leads the Forest, Trees and Agroforestry research program in partnership with Bioversity International, the International Center for Tropical Agriculture and the World Agroforestry Centre. For photos from Tree Diversity Day, click here.